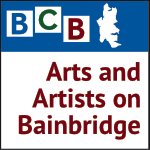 In this interview, Bainbridge Island Museum of Art Chief Curator Greg Robinson has an illuminating and delightful conversation with Chris Maynard, a local artist whose medium is (legally sourced) bird feathers. 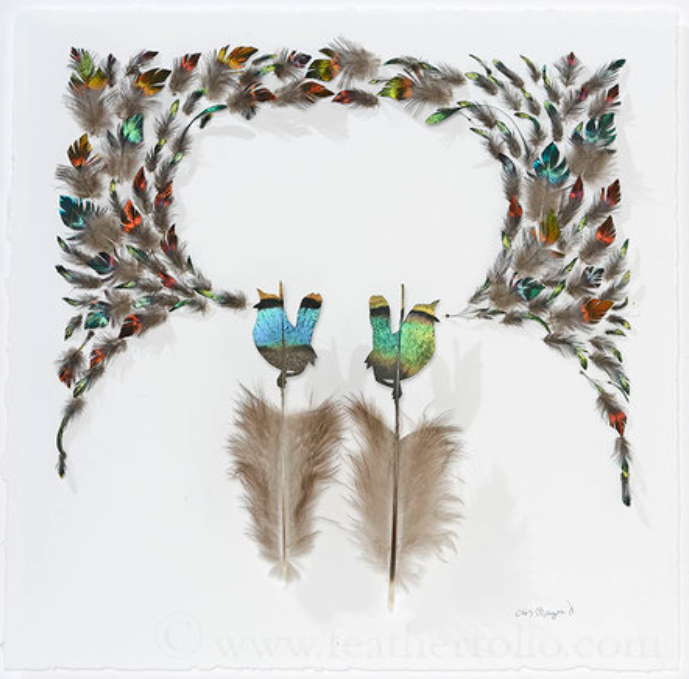 His exhibition is called “Featherfolio“. Chris’s first solo museum show has over 40 astounding artworks with feathers “carved” and artfully designed in creative compositions. This show also includes four site-specific installations of birds taking off on the walls in beautiful patterns, such as this one [link]. Chris Maynard came later to becoming an increasingly recognized full-time artist, having first had a career as a biologist. But it was that career and his long-time interest in nature, especially birds and feathers, that eventually brought him to creating what is now very unique, unusual, and exquisite finely carved designs from feathers. Chris tells us why he became an artist and why feathers would naturally be his medium of choice. In this conversation, Chris talks about who and what inspires him, and how his artistry has developed and evolved, about his artist mother and eye-surgeon father who worked with small precision tools. In this podcast, learn how Chris designs his compositions and looks for feathers that will best express his design. Or sometimes Chris holds a feather and gains inspiration for a composition. 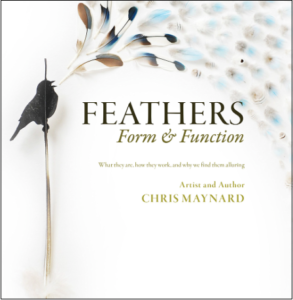 Chris’s beautifully written and photographed book, “Feathers: Form & Function“, describes “what feathers are; how they work; and why we find them alluring.” There is much to learn about feathers!